Well, I think that now is time to finish with the current Kiruna series, and I’ll do it with an spectacular building: the Ice Hotel. Type: Hotel, museum, bar, church. How to arrive: There’s a bus from Kiruna to Jukkasjarvi for about SEK 30 (SEK 14 for students). Schedule: As a hotel, its reception opens 24/7, for tourists, it’s 8:00 – 18:00. Tourist prices: The adult ticket is SEK 295; for seniors, students or military trainees it’s SEK 235; for children 7-12 years it’s SEK 150; and for children under that age, it’s free. The Ice Hotel is located in Jukkasjärvi, a small village in the shore of Torneälven (river Torne), with about 500 inhabitants and 15 Km away from Kiruna. Aside from its museum and the local church, it seems that the only interesting thing to do in the village is to pay a visit to the Ice Hotel. This is the first ice hotel known to be ever built (this is their 18th season), and it’s a complex formed by an ice church, the Absolut Ice Bar Jukkasjärvi, the proper Ice Hotel and another building with warm accomodations. The hotel, which is build using only ice blocks from Torneälven, has an area of about 6000m^2 and a constant temperature of about -5ºC. It opens from the first week of december to the end of april (when the spring starts to melt it), and each year is rebuilt from scratch, allowing to change its configuration (and the rooms) from year to year. As it’s a long and complex process, the hotel opens it’s different areas in five different phases. Its rooms can be classified in ice rooms, ice family rooms, ice suites and ice suites deluxe. 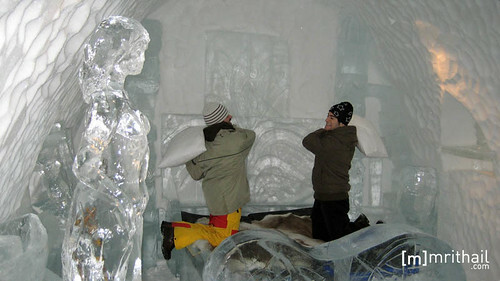 While the ice rooms are just a room with a bed, in which the only interest is to sleep by night; the suites are exclusive artworks, each one designed and decorated by a different artist (or group of artists), converting the hotel into an ice museum with best before date. As every year the hotel has to be rebuilt, the artists (and the suites) change, so it’s as if every year the hotel hosted a different art collection. In front of the main entrance to the hotel, there’s the ice church, which is also rebuilt from year to year by a different group of artists. In it, the most successful events seem to be weddings. I don’t really know if they also do standard masses, but at least is a good piece of artwork to admire. 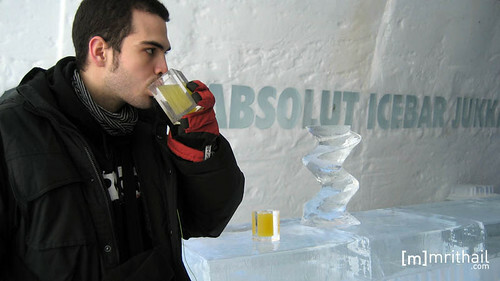 And one of the most interesting places to go to, aside from the hotel suites, is, of course, the Absolut Ice Bar Jukkasjärvi, which is also the first Ice Bar ever built. There you can drink an amazingly expensive cocktail (with or without vodka) in an ice glass, while admiring the ice cold architecture of the bar and chatting with your friends after an intense tourism day at the hotel. As I comment in the beginning of the post, there’s also warm lodgings in the Ice Hotel, in a normal building with a standard reception. the only interesting thing here is that it’s the only place where you can rest drinking a hot chocolate of a coffee. Despite the fact that when I went to Kiruna, I wasn’t really interested in the Ice Hotel, the truth is that I enjoyed this visit a lot. 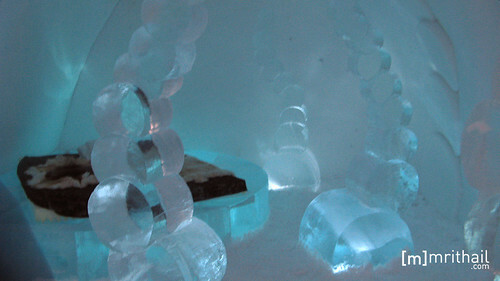 If you go close to Kiruna, I recommend you to pay a visit to the Ice Hotel, because it worths it. was there any music inside the Ice bar? i don´t remember right now..
Supongo que si estas bien abrigado no habrá problema…viento seguro que no hace.